The Abominable Snowman of Pasadena. The Werewolf of Fever Swamp. Night of the Living Dummy. These books and many more make up the Goosebumps series of books. No matter what age you are, I’m sure you’ve come into contact with a Goosebumps novel at some point. The idea to create a fictional film involving the real life writer was an idea that seems cheesy at the time, but it’s execution is done in a way to make up for the concept itself. Having just moved from New York to small town Delaware, Zach Cooper (Dylan Minnette) finds a reason to be happy about the move when he meets beautiful neighbor Hannah (Odeya Rush). He and his friend Champ (Ryan Lee) are surprised to stumble upon locked Goosebumps manuscripts, thus leading to the unleashing of a certain Abominable Snowman. Zach is able to put things together and discover that Hannah’s father is R.L. Stine (Jack Black). The four of them must join together to re-capture all of Stine’s monstrous creations. My personal expectations were certainly not high but despite it’s rather predictable story about monsters, Goosebumps is able to deliver a strong premise with interesting twists, some good humor, and Jack Black back in a good role. Jack Black really becomes the anchor of the film. As the other three main characters are all teenage actors, Black must bring his A-game to prevent the film from delving into a childish film. 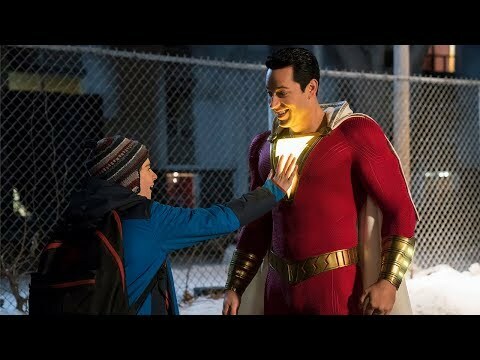 The teenage actors are certainly not bad in their roles and Dylan Minnette actually has some pretty good comedic timing. At the beginning of the film, the monster encounters come in a one-by-one manner and creates really engaging and fun scenes. Things become a little more muddled and rushed when the evil dummy Slappy, also voiced by Jack Black, gets a hold of every book and every monster in his plan to wreak havoc and go after his creator Stine. The cleverness isn’t there anymore as the film turns into a simple run away from monsters movie. Despite this, the director, Rob Letterman, and screenwriter, Darren Lemke, have just enough between the interesting monsters and an increasingly less grumpy performance from Jack Black. It isn’t so much a scary film as much as it slightly mocks the clichés of the old monster film, including the giant bug ripping off the roof. 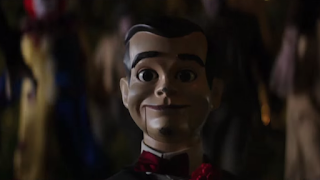 So what did you think of Goosebumps? Have you seen it, what did you think of it, and what was your favorite Goosebumps book growing up? Comment below and let me know and as always come back to I Am Sam for weekly reviews.